This pilaf is a cultural juxtaposition of a Caspian style butternut squash pilaf and the Western autumn-time favorite pumpkin-spiced seasoning. 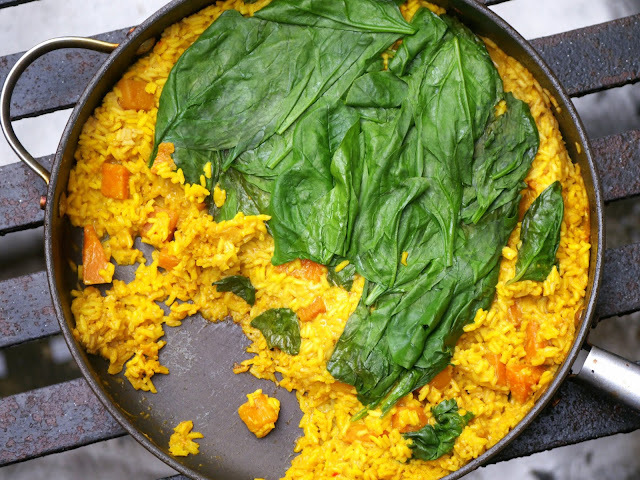 The original vegetarian Caspian pilaf does not contain yogurt and spinach, has a different spice profile, and is usually served with fried eggs. Likewise, the presented pilaf can be served with fried eggs and as an excellent and nutritious dish. It can also be a side to grilled meats and vegetables or be served with seafood. 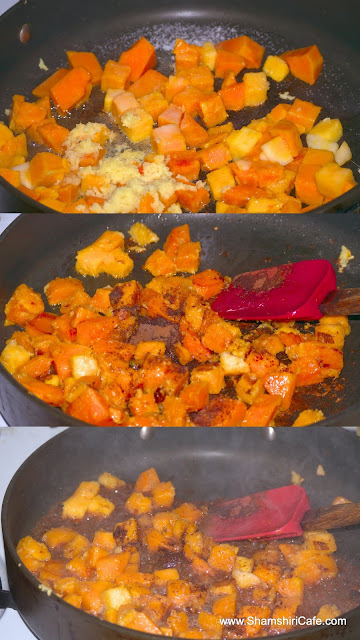 To a large skillet, set on medium heat, add the squash cubes, sugar, salt, and oil. Sauté until the squash cubes are soft and lightly caramelized. Add the ginger and sauté for a minute. Add the spices and toast in the oil for 30 seconds. Add the hot sauce, vinegar, and a dash of water to de-glaze. Add the rice and toast the grains for 30 seconds. 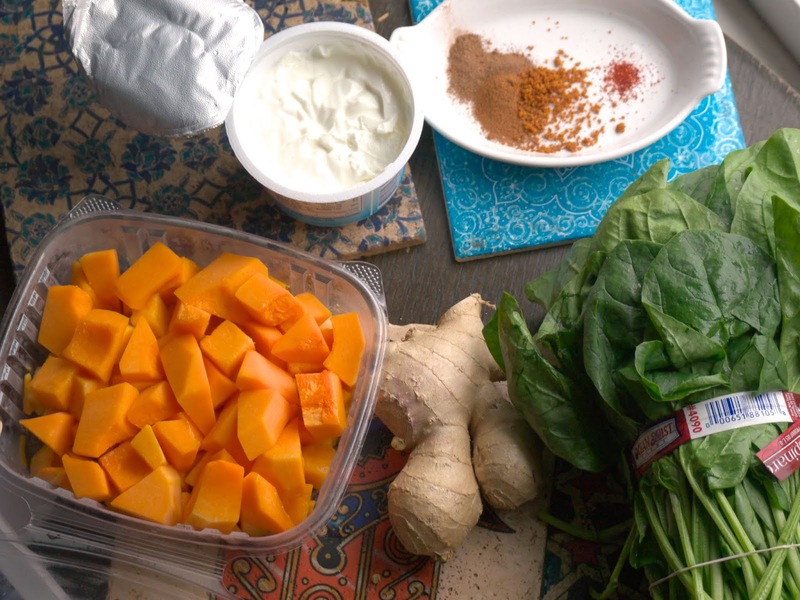 Add the water and yogurt and mix well. 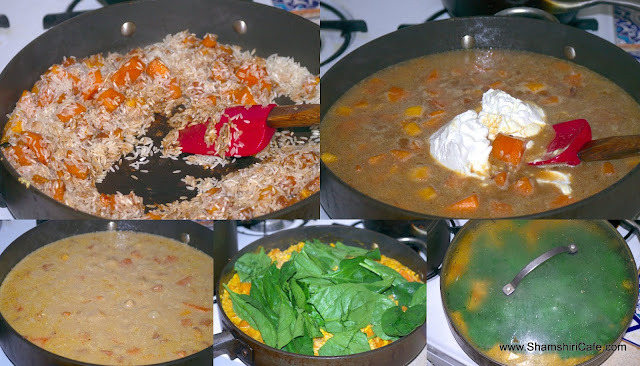 Decrease the heat to low, cover the skillet, and let the rice cook and absorb the liquid. Uncover the pan every five minutes and stir the contents to prevent the grains from sticking to the bottom. When all the surface moisture is evaporated and absorbed, arrange the spinach leaves on top, cover the pan, and let the rice steam for around 30 minutes. 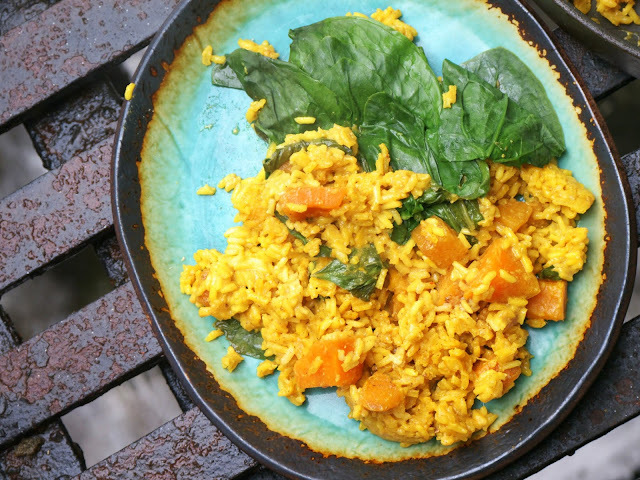 You can occasionally shake the skillet (without uncovering) to ensure the rice grains cook uniformly and do not stick to the bottom.